If we want to succeed in our initiatives in the Church, initiatives directed both ad intra and ad extra, we must revitalize our Catholic identity. To revitalize our Catholic identity, we need, first and foremost, a renewal of our sacred liturgical worship, primarily of Holy Mass but also of the office and other rites. And, in addition to our liturgical worship, we need to revive, recover, restore old devotions. For example, at my home parish there was on every Tuesday evening, the Novena to Our Lady of Perpetual Help followed by Benediction, followed by confessions. It was always well-attended. I suspect that many of you haven’t heard of the devotion to the “Divine Prisoner”, or “Prisoner in the Tabernacle”. I believe this was a strong devotion of St. Thérèse. O JESUS, DIVINE PRISONER present always in the Tabernacle as a ransom for my sins, look on me a prisoner, too, bound by my own guilt. O, relieve me from the shackles of my sins that I may give myself to the service of Thy Love. Deliver me from the shackles of my pride, sweet Jesus, from my vanity, sloth and anger, melt the stiffness of my will, break the tyranny of my passions, open wide the door of my dungeoned soul and dispel the darkness of my sins and ignorance. Have pity, O Divine Prisoner! Have pity on this poor prisoner. Help me to escape from sin so that I may always be with Thee … forever Thy prisoner! My mind chained by Thy Truth! My will chained by Thy Law! My heart chained by Thy Love! Chain me to Thee, living and dying. And may I die, dear Jesus, a prisoner in Thy Sacred Heart. Amen. Some may tut at the old-fashioned language. I respond that there is nothing wrong with old-fashioned! Let the prayers of our forebears be ours as well. So, if you would have Faith, pray. How wonderful it would be to find a cache of these old-fashioned prayer cards. I especially want a really good copy of the card (and statue) of Our Lady Queen of the Clergy. I looked around in shops in Paris, but to no avail. Perhaps they could be an opportunity for some entrepreneur. This entry was posted in ¡Hagan lío!, "How To..." - Practical Notes, GO TO CONFESSION, Hard-Identity Catholicism, The future and our choices and tagged devotions, Divine Prisoner. Bookmark the permalink. I have by Fr. F.X. Lasance. we need those classic and timeless prayers. that He makes himself a Prisoner in the Tabernacle for the sake of our souls. You and I know by faith that hidden in the sacramental species is Christ, that Christ with His Body, with His Blood, with His Soul, and with His Divinity, prisoner of love. People on Etsy sell old vintage Catholic prayer cards that they collect. You might have success there. I’ve also had some random success by buying old used Catholic books online only to find old prayer cards in them as well as some other cool old things, including a priest’s ordination prayer card from the early 1920’s. Further to my Etsy search, some crafty people have started making reproductions of the antique lace-styled French prayer cards. They don’t sell for cheap, though. My beloved father gave me the following beautiful prayer when I was 15 years old. While it is not specifically addressed to our Lord as the Prisoner in the Tabernacle, it runs along those lines and remains among the prayers I continue to pray every evening 55 years later. 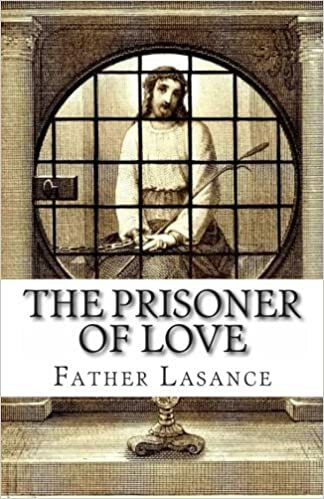 There is a current book called The Prisoner of Love with this picture on the cover. Inside are reproductions of some holy cards.